Game engines will play a larger role in the design and visualization of manufactured products. Game engines like Unity and Unreal Engine are already making inroads to bring CAD data into the engine where advanced lighting, materials, cameras and scripted mechanics can simulate real-world environments. Real-time rendering enables huge time savings over traditional visualization and rendering processes, and allows the user experience to go virtual. Virtual prototyping is in many cases displacing processes of the past which required large, expensive models of cars, jets and even submarines to optimize product design. Virtual prototyping allows designers to visualize, walk around and even operate virtual models, giving them a multitude of tools to inspect and measure every square inch of the new design. Moreover, the design can be iterated as quickly as virtual components can be replaced. Generally speaking, the more iterations the design passes through, the better the design will be. Virtual prototyping promises lower development costs, increased optimization, and even the ability to market products before the expense of manufacturing is undertaken. Author’s note: This graph shows virtual prototyping is on the increase, and this article on virtual prototype examples makes several good points as to where a 1:1 virtual model can avoid downstream problems. This article mentions huge improvements in accuracy and drops in factory injuries due to virtual technologies. Game engines and associated product configuration tools will make creating virtual products easier for manufacturers, and customers will be empowered to configure their products, leading to increased buyer engagement. Porsche and Tesla already allow customers to configure their products; once you have configured the interior, exterior and drive train of your Porsche, you can send the configuration file to a local dealer who will place the order for you. Tesla’s configurator eventually leads you to a ‘place order’ button. Increased customer engagement will lead to higher sales, leading to further proliferation of product configuration tools. Author’s note: From insurance to laptops to cars, product configuration has been shown to increase sales. Digital twins (digital replicas of physical products or processes), will become even more widespread as the availability of tools and successful implementations increase. Internet of Things (IOT) device sensors and connectivity to virtual environments allows manufacturers to mimic real-world situations. Artificial intelligence and machine learning systems will increasingly leverage historical performance data to predict component and system behavior, allowing designers to optimize weak links and thus increase profit and safety margins, while reducing product recall and scrap. Author’s note: This article does a good job describing the difference between a simulation and a digital twin. To bring a CAD model into visualization software, the right model should be in the best condition possible. View, repair, translation and comparison tools can aid in this process, and will increase in usage during 2019. Optimal CAD data pays off in downstream processes and gives companies in an increasingly competitive environment a critical edge over rivals. Access to these tools needs to be on-demand in order to gain maximum functional benefit for technical and non-technical users. 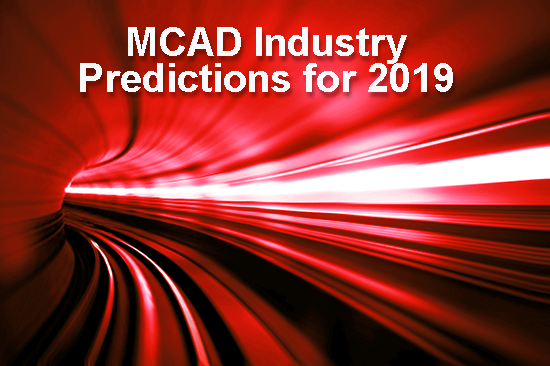 New licensing and networking technologies promise to put powerful CAD productivity tools within the reach of every designer and engineer. If you haven’t already tried TransMagic, there is a fully functioning 7-day eval available.